Yesterday, I received my property tax bill, wherein I was reminded once again that my car—a 1998 Toyota Sienna minivan—has hit rock bottom in depreciation and will soon qualify as an “antique.” I realize we live in a youth culture, but an antique? So what does that say about me? I’ve watched enough Antique Roadshow episodes to know that you should never clean an antique. As you can see, my Sienna retains its original “dirty patina” for maximum value. Soon I will be able to get one of those specialty black and white license plates with a picture of an old jalopy on it. 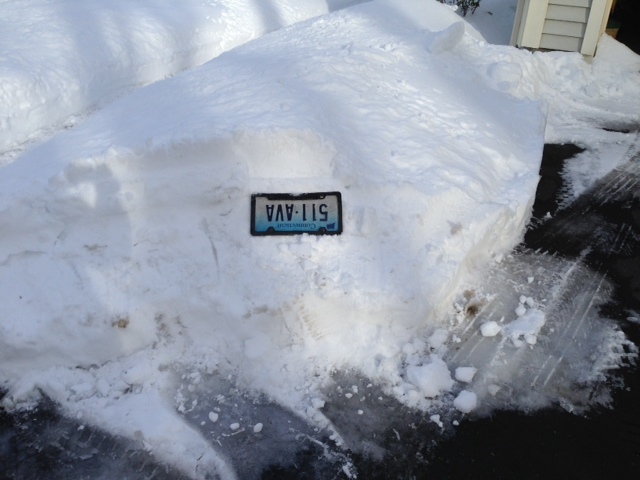 It would be a welcome replacement for my front plate, which this winter fell off and became lodged in the snow bank near my garage every time I backed out and had to perform an 8-point turn to navigate the ever-narrowing passage our driveway became after multiple snow events. Wouldn’t this plate look better than the one below? I’ll mosey over to investigate the designated spot, and, with my hand on the youngster’s shoulder, say (in my newly adopted drawl), “Ya have a good eye, son. That is indeed from a melted crayon. It was 2002, and my family and I drove to Hersey Park. Crazy times. I remember Kids Bop 1 rockin’ the CD player—that was when the CD player still worked, mind you—and we stopped off at a Friendly’s restaurant for one CheesyMac, one CheesyMac and Frank (“don’t grill it”), one Chicken Quesadilla appetizer size, and one Reuben Supermelt, plus two Cone Head Sundaes. A’ course the kids were given crayons with their placemats and in two seconds they’d solved the puzzles and were on to drawin’ dinosaurs and such. Yeah, the ol’ Sienna has seen her share of Friendly’s parking lots over the years. “I always tucked those crayons into my purse (note to self: change that to man bag?) as I slid outa’ the booth ‘cause ya never know when the car might careen into some ditch and we’d have to eat ‘em to survive. “That partic’lar crayon raght there was used by my son to draw a Tyrannosaurus Rex. The kids did a lota’ drawin’ in those days. As ya can see, DVD players weren’t installed in these here vee-hicles.” At this, my young friend’s eyes will grow wide with astonishment and, probably, there will be the hint of a superior smirk tugging at his lips, but I’ll continue on and tell him how the crayon was dropped and then crushed under a little foot and how it fused with the carpet in a melted, matted, mound of goo. He’ll nod appreciatively, say something snarky like, “Thanks for the history lesson,” and move on to the 1993 40th Anniversary Ruby Red corvette from the National Corvette Museum Skydome sinkhole next to me. See? Disaster can strike anywhere. Ya gotta have that survival kit ready. Image provided by the National Corvette Museum. The Ruby Red may be banged up–but what a story! With 162,208 miles on her, the Sienna’s been a good car and is still going strong, despite a little neglect. I recently had to take the seats out to pick up a tall bookcase my daughter bought. I decided to take advantage of the open space, so Sunday I pulled her out of the garage to give her a good cleaning (inside not out, Keno brothers)—and made a bizarre discovery. As is often the case, a small mistake led me to uncover a shocking fact: my car has been turned into a gambling establishment by some very enterprising mice or chipmunks. By following the evidence left by a careless casino patron or inexperienced attendant, I uncovered that a slot machine is cleverly concealed behind the plastic panel in the hatchback section of the van. Here’s how the vice raid went down: one day on the carpet I spied a small spill of birdseed. This was not suspect in itself as I have hauled 40-pound bags of Lyric seed on many occasions. Indeed, a large bag can usually be found slouched near my car. As I began to vacuum up the little pile, however, the suction drew more seed from its hiding place, and soon I realized that, recognizing opportunity when they saw it, the little varmints surreptitiously have been moving product from the bag into my car to support their casino games. A little digging dislodged more seed, and deeper digging revealed more seed still. I had uncovered a goldmine. I can only think that the poker tables are kept in the spare tire tool box and the roulette wheels stashed in the backseat cup holders. I don’t even want to think about what kinds of illicit activities take place in the wheel well. JACKPOT! Watch that seed pour into the seed tray! I don’t despair of this turn of events. On the contrary, I consider it just one more notch in the lore of my Sienna. On the classic car circuit I’ll have some notoriety, and the crowd standing on the lush, green lawn will buzz with excitement as I regale them with the story of when my Sienna went over to the seedy side. Maybe, they’ll even make a movie. It could be called The Car that Spewed Birdseed or Birdseed Jackpot or—given a Hitchcockian twist—The Birdseed. It could star Jeremy Meeks—expanding on his modeling career—as a handsome felon with a heart of gold who recruits a bunch of mice (chipmunks have been done) to run a mobile casino that stays just one mile (one kilometer for the European market) ahead of the law. When they are finally caught, Meeks’ character inadvertently takes a glamour mug shot and his meteoric rise to fame begins. I’m thinking Disney might be interested. Mickey Mouse could play the evil pit boss in yet another dark, revisionist character treatment. Yes, the ol’ Sienna has many tales to tell. She’s not getting older; she’s just getting better. I’m sure they’d deal you in–if you bring a couple of nice tomatoes, a squash or two, a few peaches…oh just bring your whole garden.